This past summer, Scott Davies notched six cashes at the 2014 World Series of Poker, which included a fourth-place finish in the $10,000 Heads-Up No-Limit Hold’em for $111,942. Davis traveled from his home in Canada and headed to Australia for even more WSOP action, and now he’ll head home with a shiny gold bracelet and AU$850,136 in prize money after topping a field of 329 players to win the 2014 WSOP Asia-Pacific Main Event. Action resumed in Level 24 (15,000/30,000/5,000) and it didn’t take long for the first elimination of the day to occur. On Hand #14, 2010 WSOP Player of the Year Frank Kassela raised to 90,000, and Ang Italiano, the last Australian in the field, called from the small blind. Italiano then moved all in on the flop, and Kassela snap-called with the Kassela . Italiano had the . Kassela was well out in front with top pair, but Italiano picked up a big draw with the turn. Unfortunately for her, and the dozens of railbirds supporting her, the blanked on the river and Italiano was out in sixth place for AU$118,769 — not too shabby considering she qualified for the tournament for AU$65. Kassela took over the chip lead after that hand, but just six hands later Davies would double through him holding aces. One hand after that, Kassela would fall in fifth when he ran into aces yet again. Kyle Montgomery was the next to go when his failed to improve against Davies’ , and then seven hands later, on Hand #38 in Level 25 (20,000/40,000/5,000), Henry Wang followed him out the door in third place when he shoved all in preflop holding the and ran smack dab into Davies’ . Heads-up play began fairly even between Davies and Jack Salter, who finished runner-up in the European Poker Tour Grand Final earlier this year, and the two wouldn’t fluctuate much over the course of the next 47 hands. The stacks were deep, and the players skilled, so it seemed destined to be a long night of poker, barring a big cooler, of course. That cooler arrived on Hand #85 of the final table, which took place in Level 26 (25,000/50,000). It began when Salter opened for 105,000 and then called when Davies three-bet to 300,000. When the flop came down , Davies bet 175,000, Salter called, and the peeled off on the turn. Davies bet what appeared to be 330,000, Salter raised to 930,000, and Davies took a moment before three-betting to 1.8 million. Salter thought for nearly two minutes before announcing that he was all in, and Davies snap-called. Salter showed the for trip tens, and Davies had the for a flopped full house. "I'll use my one time," Salter said, referencing Davies' use of it earlier at the final table. Both players were on their feet with Davies' arm slung over Salter's shoulder. They watched together as the dealer burned one last time and put out the . 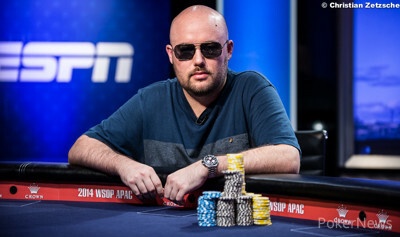 Salter had missed and would officially finish in second place, which came with a nice consolation prize of AU$516,960. 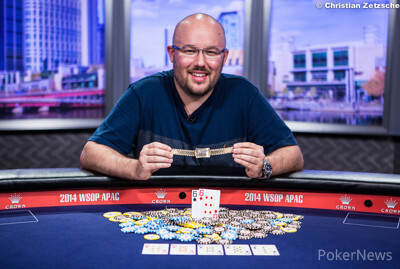 Congratulations to Scott Davies on winning his first gold bracelet and on becoming the 2014 WSOP Asia-Pacific Main Event champion. That does it for PokerNews' coverage from Crown Casino in Melbourne, Australia. Thanks for tuning in, and we'll see you at the WSOP November Nine coming up in less than a month's time on November 10! Hand #82: Scott Davies raised to 125,000 from the button and Jack Salter folded. Hand #83: Salter raised to 105,000 and Davies folded. Hand #84: It appeared Davies gave Salter a walk. Hand #85: In what would be the final hand of the tournament, Salter opened for 105,000 and then called when Davies three-bet to 300,000. When the flop came down , Davies bet 175,000, Salter called, and the peeled off on the turn. Davies bet what appeared to be 330,000, Salter raised to 930,000, and Davies took a moment before three-betting to 1.8 million. Salter thought for nearly two minutes before announcing that he was all in and Davies snap-called. It was a cooler. Salter had flopped trip tens, but Davies had flopped sixes full. Salter missed and finished as runner-up, which comes with a nice consolation prize of AU$516,960. Hand #75: Jack Salter raised to 105,000 from the button, and Scott Davies folded from the big blind. Hand #76: Scott Davies called on the button, and Jack Salter raised to 155,000. Davies folded, and Salter won the pot. Hand #77: Jack Salter gave Scott Davies a walk. Hand #78: Scott Davies called from the button, and Jack Salter raised to 155,000 from the big blind. Davies folded. Hand #79: Jack Salter made it 105,000 to go on the button, and Scott Davies called from the big blind to see the flop come down . Davies checked, and Salter bet 75,000. Davies check-raised to 200,000, and Salter folded. Hand #80: Scott Davies opened on the button to 125,000, and Jack Salter called from the big blind to see the flop come down . Salter checked, and Davies bet 125,000. Salter check-raised to 345,000, and Davies folded. Hand #81: Jack Salter raised to 105,000 n the button, and Scott Davies called to see the flop come down . Davies led with a bet of 150,000, and Salter folded. Hand #67: Jack Salter raised the button to 105,000 and Scott Davies called. The flop saw Davies lead out for 150,000 and Salter folded. Hand #68: Davies raised to 125,000 and Salter folded. Hand #69: Salter raised to 105,000 and Davies folded. Hand #70: Davies folded the button and Salter received a walk. 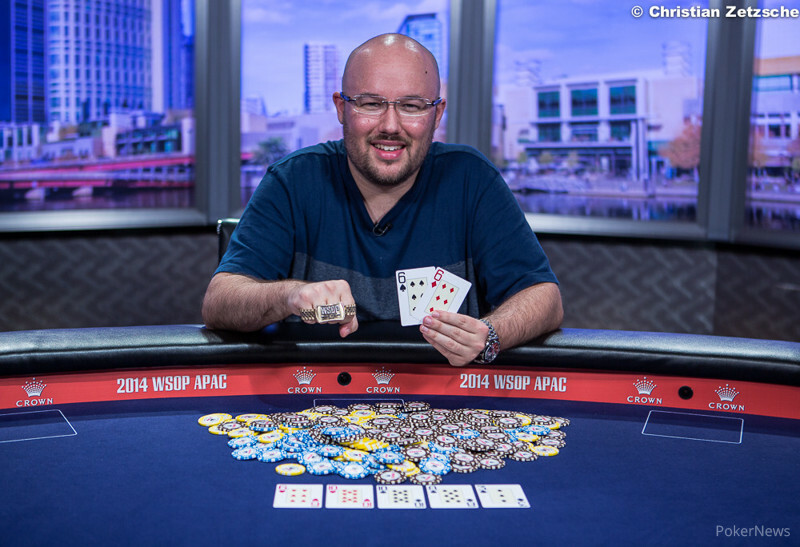 Hand #71: Salter raised to 105,000 and won the pot. Hand #72: Davies raised to 125,000, Salter called, and the flop came down . Salter check-called a bet of 125,000, both players checked the turn, and the completed the board on the river. Salter fired out 180,000 or so and it did the trick as Davies folded. Hand #73: Salter folded and Davies received a walk. Hand #74: Davies limped, Salter checked his option, and both players checked the flop. Salter bet 100,000 on the turn, Davies called, and both players returned to checking on the river. Salter showed the for ace high, and it was good as Davies mucked. Hand #63: Jack Salter raised on the button to 90,000, and Scott Davies reraised to 275,000 from the big blind. Salter called, and the flop came down . Davies checked, Salter bet 245,000, and Davies folded. Hand #64: Scott Davies raised to 100,000 on the button, and Jack Salter filed from the big blind. Hand #65: Jack Salter raised to 90,000 on the button, and Scott Davies folded from the big blind. Hand #66: Scott Davies raised to 100,000 on the button, and Jack Salter called from the big blind to see the flop come down . Both players checked, and the turn was the . Salter bet 75,000, and Davies called. The river was the , and Salter bet 145,000. Davies called with the for a rivered pair of kings, and Salter showed a losing for a pair of jacks. Hand #52: Scott Davies limped the button, Jack Salter checked his option, and then both players checked the flop as well as the turn. When the completed the board on the river, Salter bet 170,000 or so and Davies folded. Hand #53: Salter raised to 90,000 from the small blind, Davies called, and both players checked the flop. The turn saw Davies bet 85,000, Salter called, and the completed the board on the river. Davies bet 185,000 and Salter tank-folded. Hand #54: Davies raised to 100,000 and Salter folded. Hand #55: Davies received a walk. Hand #56: Davies raised to 100,000, Salter called, and the flop fell . Salter check-folded to a bet of 100,000. Hand #57: Salter raised to 90,000 and then folded when Davies three-bet to 275,000. Hand #58: Davies raised to 100,000, Salter called, and both players checked it down as the board ran out . Davies showed the and Salter mucked. Hand #59: Salter raised to 90,000, Davies called and then both players checked the flop as well as the turn. Davies checked the river and then folded as Salter lined up a bet. Hand #60: Davies limped, Salter checked his option and then both players checked the flop. Salter led out for 40,000 on the turn and then called when Davies raised to 140,000. When the completed the board on the river, Salter checked and then folded to a bet of 235,000 from Davies. Hand #61: Salter raised to 90,000 and Davies folded. Hand #62: Davies limped and then folded when Salter raised to 120,000. Hand #52: Jack Salter raised to 80,000 on the button, and Scott Davies made the call from the big blind. "Can't turn down a discount," said Davies, referencing Salter's preflop raise was 10,000 cheaper on this hand than what he has previously been making it. The flop came down , and Davies checked. Salter bet 95,000, but he was met with resistance in the form of a check-raise to 285,000. Salter called, and the turn was the to pair the board. On fourth street, Davies led for 240,000. Salter stuck around with a call, and the dealer completed the board with the on the river. Davies checked on the end, and Salter reached for chips. Salter fired 930,000, and this sent Davies into the tank for several minutes. Davies talk out loud a bit to himself while he tanked. "You're such a sicko, Jack," he said at one point. Then, the tournament director leaned in and told Davies that the clock had been called and the countdown began. With just a few seconds left on the clock, Davies folded, and Salter won the pot. 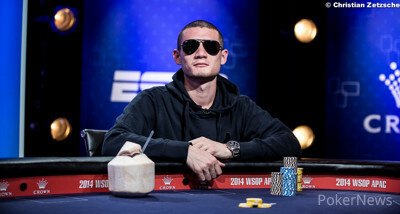 Who Will Emerge as the 2014 WSOP APAC Main Event Champion?